Cold brew coffee is a recent trend. Coffee aficionados worldwide are grabbing hold of this trend and trying out new combination of the concentrate created by cold brew machines and hot or cold water. Cold brewing coffee grounds produces an aromatic, more flavourful, less acidic and less bitter coffee than anything brewed with a drip or single-cup machine. One company jumping on this market is OXO, an product design company focussed making things that will help people everywhere improve their lives. The Good Grips Cold Brew is very simple to use. 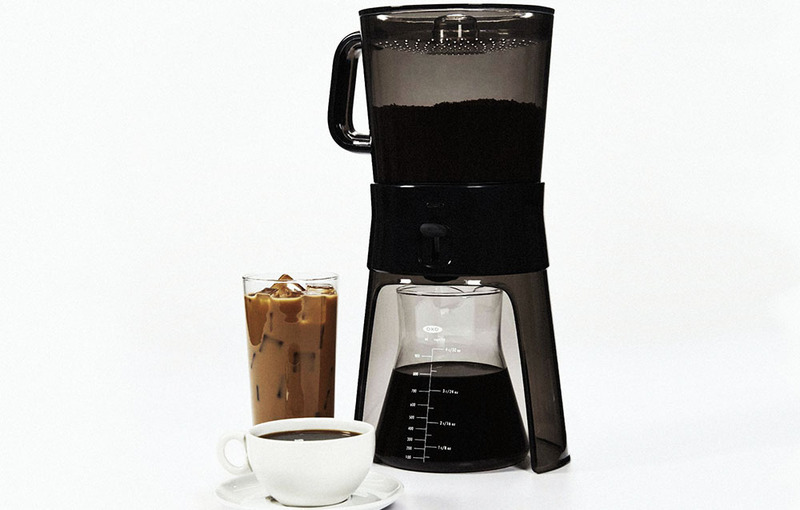 You follow four simple steps – put grounds in “Brewing Container”, add water through the “Rainmaker”, brew and drain the concentrate into the glass carafe. The result is a highly concentrated coffee that you can store in the fridge and dole out as you need it. You store it in the Glass Carafe, covered, in the fridge. If you’re not confident storing the Glass Carafe in the fridge with the lid it came with, try pouring the concentrate in a mason jar with a reusable seal. Unlike traditional cold coffee making, which requires a cheese cloth and a lot of mess, this is a clean, easy way to get your caffeine fix. It’s easy to rinse the parts and the components are dishwasher safe. With the concentrate, you can make any type of coffee you prefer. Add 2 oz (1/4 cup) of concentrate to your cup. Top off with hot water. Or cold water. Or milk. Or ice cream – whatever you want to do! While following the suggested ratio of grounds to water is, well, suggested, you can mix it up and experiment until you find the ratio that creates your preferred coffee concentrate. Then experiment some more with the concentrate to create a coffee-based drink or dish that suits your taste. A few small notes though. Cold brewing does take significantly longer – the concentrate needs 12 to 24 hours to strengthen in the Brewing Container. It also takes 10 – 15 minutes for the concentrate to drain into the Glass Carafe. When you remove the Glass Carafe, you may want to set a cup under the drip just in case it leaks. Finally, you may want to purchase some extra filters just in case. BPA free and made with shatter resistant glass.